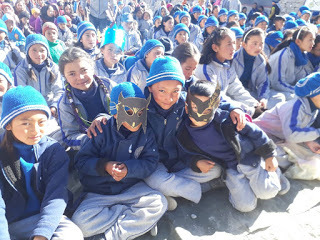 [vc_row][vc_column][vc_column_text]Siddhartha School Project’s #GivingTuesday campaign was a great success in the States, but did you know that our community in Ladakh had an amazing #GivingTuesday campaign as well?! We are so inspired by what the Siddhartha School staff, families and local community did to support the #GivingTuesday Matching Gift Campaign. Mr. Tsering Angchuk, our US liaison, and coordinator, and Ms. Dechen Wangmo, the school principal, worked very hard coordinating a “Thanksgiving Mela” festival to raise money while the matching gift from our exceptionally generous benefactors was in effect. Hosted at the school, the festival was a huge success, thanks to the many volunteers, teachers, and staff who set it up, and the many local friends and families who came out to show their support for SSP and enjoy the day. The community raised 1 lakh 82,295 rupees—US$2,605, for a grand total of US$5,210 for SSP’s #GivingTuesday campaign for the school!! The students, staff, and community in Ladakh are so very grateful for YOUR continued support. PS: Did you miss #GivingTuesday and wanted to make a gift? You still can! We super excited to share that we’ve set a STRETCH GOAL to provide much-needed uniforms, books, hot meals, and school supplies for all our scholarship children. Click here to make your gift to help the school provide these necessities to our most vulnerable children.